Cottage feel with all the modern conveniences. This is a private home, not part of another property. 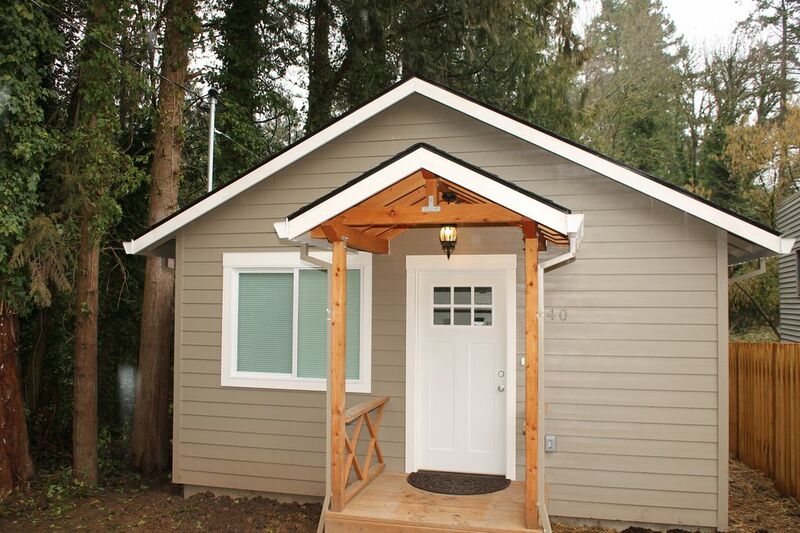 It has a cottage feel with all the modern conveniences. Kitchen w/ all appliances, quartz counters, insta-hot. Whole-house audio, HDTV w/ surround sound, bluray or video streaming w/ 40 Mbps internet. Master w/queen, second w/twin bunk beds. Washer/Dryer. Everything you need in a small space. This is Portland tiny house living at its best. Vaulted ceilings with skylights and all the modern amenities make the most of this 600 sq ft house. Just a 2 min. walk to coffee and IBU restaurant/pub. About 10 min. walk to Albert Kelly Park or Hamilton City Park. Also close to OHSU. Frank Halpin has built a reputation for client satisfaction by devoting every effort to making his client's experience as easy as possible. He is a Realtor® who understands your needs when buying, selling, or relocating to the greater Portland Metro area; assisting at every step of the process to make sure your next real estate transaction goes smoothly. As a licensed Real Estate Broker, Realtor® and Real Estate Developer, Frank is uniquely suited to bring his broad experience in the real estate industry to bear on your transaction. He knows how to market your property to bring you the best offer while meeting all of your selling objectives. Frank is also an experienced buyer's agent that can help you find and purchase your first home, your dream home or a great investment opportunity. Place was so clean and perfect for our family. It was central to the zoo and the children’s museum. This is a great little house - clean, quiet, well furnished, functional, and beautifully decorated. Its right off the busy street but you hardly notice it. We opened the windows on the other side of the house and enjoyed the trees and listening to rain in the forest. We would stay here again! What nice place to stay! A very comfortable house. Everything in good working order. Very clean. The cozy furnished tech cottage was just that. Our family of 3 had a wonderful time. Our teenager could retreat to her own room while we relaxed after a long day of sightseeing in the living room. Getting ready in the morning was fun as everyone could control the music for the whole house with a speaker in every room. We hope Frank owns and continues to rent this home for a long time! Everything was just right. Home is small but comfortable with a nice entertainment system. It is set back a bit from the main road but close drive, bike or walk to restaurants and shopping. Worked great for family with two kids, we were glad to find this place. This little house was in a perfect location for us (four women attending a conference). It was in a great location just off a main road, but was very quiet. It gave us more room than staying in two hotel rooms, and it was equipped with everything you could need. We all agreed it would be perfect for a family, as the zoo, children’s museum and large park were just minutes away. For four women, however, we were wishing there were more mirrors in the house while getting ready in the morning. But for most people staying here, that probably isn’t an issue.